My Thoughts: Some thrillers start out with a bang. The action kicks off in the opening chapter with the suspense building to a fever pitch from the first sentence. Other thrillers are more subtle, taking their time to create the mystery and build the suspense. Neither is better than the other; both are quite effective storytelling methods in the right hands. Yet, some readers will prefer one versus the other. For those readers, The Broken Girls falls into the latter category. In The Broken Girls Ms. St. James allows the story to build organically, allowing readers the chance to immerse themselves into the boarding school world of Idlewild during its heyday and in the present day before upping the ante. She does so by flipping back and forth in time and in narrator, providing readers with not only a well-rounded view of the school, its rules, and its inhabitants but also Fiona’s world of love and loss. Therefore, before readers understand that there is a mystery, they are already sympathetically inclined towards all of the girls, which in turn creates the necessary tension that makes a thriller a good one. One other thing to note is the fact that The Broken Girls is a quintessential Gothic novel. We have the gloomy setting complete with decaying school buildings and grounds that may or may not be haunted. There is the fact that Idlewild is purported to be cursed. There are girls needing to be rescued, and there is romance. But this is not a traditional Gothic novel in that the hero is not a knight in shining armor or even a man coming to rescue the damsels in distress. This is, to some extent, a feminist Gothic novel, making it timely as well as entertaining. 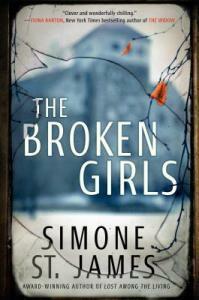 The Broken Girls is highly entertaining on several levels. The otherworldly aspects are extremely effective, lending itself to more than one frisson of fear. There is a historical fiction element that reminds readers not only of history’s greatest tragedies but also of a certain societal mindset that made it allowable to hide young women in a rundown boarding school in the guise of help. Plus, there is Fiona’s story as she comes to grips not only with her past but with her future. Blended into all of that is a mystery that keeps you guessing with the many surprises thrown into the narrative’s path.